It was also nominated as a Bookstores That Care "Best Book of 1998"
Shades of Gray has it all! Amanda Ashley has written a wonderfully passionate book full of suspense, intrigue, horror and romance. It is certain to keep the reader’s interest as the story unfolds with each passing page. Set in 1990’s Los Angeles, California, Shades of Gray tells the tale of Marisa Richards, an ordinary single woman, whose life is thrown a curve and gets complicated by a vampire. Marisa visits a local small carnival that boasts in having an actual Transylvanian vampire. She sees the attraction, Count Alexi Kristov laid out in a casket, not really knowing whether it is the real deal or not. As she is leaving, she scrapes her leg, causing a bit of blood to flow. After her visit mysterious murders start happening – involving extreme blood loss. Soon after she meets Grigori -- a handsome tall stranger with dark eyes, also a vampire but Marisa has no idea. Grigori wants Marisa but wants her to submit to him out of her own free will. This is the first woman in 200 hundred years he has felt anything more than bloodlust. He wants to show Marisa that not all vampires are a blood thirsty lot, and that he himself is but a man who frequents the night, and really loves her. Marisa is of course attracted to Grigori. She has yet to believe there are such things as vampires roaming the earth. Her passion for him is great but she is unwilling to bow down to just any man – only the right one. Can she trust him? Is Grigori the one for her? Throughout Shades of Gray there are surprises and plot twists. Clues are thrown at the reader in the manner of a detective novel, as Marisa comes to discover more about the truth of vampires and her own heart’s feelings while being horrified and confused simultaneously. The style of writing is very effective. Dialogue comes across as real and believable. Events one after the other build to form a brick house of suspense, horror and romance at times reflective of a thriller. Transitions of scenes are done effortlessly. The use of first person narrative to describe what each character is thinking is at times bone chilling. And descriptions are vivid, full of well-chosen as-and-like words and metaphors. Amanda Ashley has written the essential Vampire Romance with Shades of Gray. It is a must read. No stone is left unturned – or no casket lid is left unopened, so to speak. I thoroughly enjoyed falling into its grasp. Someday, maybe those folks in Hollywood will have enough common sense to turn it into the movie of the week – I know it will be a sight for sore eyes. © Love Romances, 2001. All Rights Reserved. 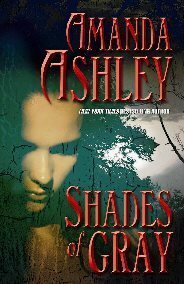 SHADES OF GRAY is one of the best vampire romances to emerge in a long time. The characters make the novel feel very authentic to the point that readers will believe. However, it is the unique story line that showcases a love (hate) rectangular series of relationships that demonstrate why awesome author, Amanda Ashley, is one of the leading writers of supernatural romance. Amanda Ashley has set the stage once again for a riveting story of love, revenge, and seduction by vampire. Marisa, Grigori, and Edward must join forces, but it is an uneasy alliance. The unlikely allies are pitted against Alexi, an ancient creature of power and strength. A creature who has never given a thought to others, only his own wants, he is bloated with his own sense of invincibility. Once again Amanda leads us willingly into the night and shows us the wonder and beauty to be found, and also the shadows. Poignant and beautiful stories erupt from her pen with a dark and compelling sensuality underlying it all. To those not familiar with her work, Amanda shows us that some of what lurks in the shadows of the night is evil, but there is also the good, the beautiful, and there can be a satisfaction in knowing that they co-exist. She shows us how sworn enemies can be brought to reconsider unseen truths, and how love can, in truth, conquer the dark. Shades Of Gray brings together a wonderful cast of characters who have to deal with issues of trust, love, and the differences between perceived and real truth, for all is not as it seems. A definite must-buy for those who love the genre. If you have already added this to your collection, I have great news. Amanda will be giving us Edward's story in February of this coming year. After Sundown will tell of Edward Ramsey’s life. I know that I am greatly looking forward to this book! In Shades of Gray, Amanda Ashley has set the stage once again for a riveting story of love, revenge, and seduction by vampire. Marissa, Grigori, and Edward must join forces, but it is an uneasy alliance. The unlikely allies are pitted against Alexi, an ancient creature of power and strength. A creature who has never given a thought to others, only his own wants, he is bloated with his own sense of invincibility. Once again Amanda leads us willingly into the night and shows us the wonder and beauty to be found, and also the shadows. Shades of Gray is another of the poignant and beautiful stories which erupt from her pen with a dark and compelling sensuality underlying all. The richness and depth of character makes her a leader in the field. To those not familiar with her work, Amanda shows us that some of what lurks in the shadows of the night is evil, but there is also the good, the beautiful, and there can be a satisfaction in knowing that they co-exist. She shows us how sworn enemies can be brought to reconsider unseen truths, and how love can, in truth, conquer the dark. Shades Of Gray brings together a wonderful cast of characters who have to deal with issues of trust, love, and the differences between perceived and real truth, for all is not as it seems. A definite must-buy for those who love the genre. If you have already added this to your collection, and if your haven't already heard, Amanda has now given us Edward's story in February. After Sundown continues the story, and tells of Edward Ramsey’s life. I know that I greatly enjoyed this book as well! Amanda Ashley is a definite fixture on my Favourites Shelf. Bound by chains of silver, the vampire had slept for a hundred years, locked in a world of pain and hunger until the seductive scent of one woman’s blood recalled him to ravenous life. Unnerved by the sight of the carnival’s captive “vampire”, she stumbled from the tend and into the arms of the most striking man she had ever seen. Mesmerized by his supernatural embrace, she believed him when he swore all he desired to drink were her kisses. Lost in darkness, Grigori found new sustenance in the light of Marisa’s love, a new purpose in his life, for only he could protect her from the evil that stalked the night. Now, hungering for her bittersweet caress, he vowed to show her that not all of the undead were monsters, and that, somewhere between the black and white of damnation and desire lay infinite SHADES OF GRAY. The Roskovich Carnival was the smallest, seediest looking excuse for a circus Marisa Richards had ever seen. Its main claim to fame was their boast that, inside the largest of their three rather shabby-looking tents, they had the body of a genuine Transylvanian vampire. Marisa paid the wizened ticket-taker six-fifty and then, by-passing the usual carnival rides and games, entered the large blue and white striped side-show tent along with the other hardy souls who had ventured out in the rain on a cool and windy Halloween evening. She wandered from one attraction to the other, pausing to look at the bearded lady, at a two-headed man who was so obviously a fake it was laughable. Moving on, she saw a sad-faced giant clad in a leopard-skin costume that reminded her of Fred Flintstone. There was a morose-looking dwarf, a man who had skin like that of a reptile, a diminutive woman who was covered from head to foot with psychedelic tattoos. Marisa felt a sudden chill skitter down her spine as she stepped into the small tent. Good special effects, she mused. She glanced over her shoulder, expecting to see some sort of fan, but saw nothing. And then she saw the coffin. It was the old-fashioned kind, bigger at the top than the bottom. Dull black in color, it rested on a raised wooden dais in the center of the sawdust-strewn floor. The closed lid was covered with a large spray of fake, blood-red roses. There were perhaps a dozen other people in the tent. They stood in a loose semi-circle around the casket, talking in hushed whispers. A little girl tugged on her mother's hand, begging to go on a pony ride. Two teenaged boys stood together, teasing a pretty teenage girl by making jokes about the undead and creatures of the night. The crowd fell silent as a tall, cadaver-thin man dressed in a dark brown suit and old-fashioned cravat entered the tent and took his place at the head of the coffin. He stood there, his pale hands folded, his expression somber, while the lights dimmed. His voice was heavily accented, though Marisa could not place it. Hungarian, perhaps, or Russian? Marisa took a step forward, drawn in by the man's words. She had never been one to believe in ghosts or goblins. She wasn't afraid of the dark. She didn't believe in witches or warlocks or vampires. But something in this man's voice, his words, made her believe. She felt the hair raise along her arms as Silvano took a deep breath and began to speak again. Very slowly, Silvano removed the plastic roses from the top of the coffin. He hesitated, for dramatic effect, Marisa surmised, and then, with a flourish, lifted the lid, which was lined with white satin. Marisa hung back until everyone else had taken a good look at the Count and then, on legs that suddenly felt like limp spaghetti, she climbed the two steps up to the dais and looked down into the casket. The bed of the coffin was lined with the same white satin that lined the lid. A silver cross, perhaps a foot tall, was secured to the foot of the coffin. Similar crosses were placed on either side of the vampire's head. The vampire, attired in an old-fashioned shiny black suit, was laid out with his arms at his sides. She thought it odd that his hands were tightly clenched. A thick silver chain was wrapped around his body from his chest to his ankles. His skin, which was almost as white as the satin beneath him, was drawn paper-thin over his skull-like head. Pale brown lashes lay against his sunken cheeks. His hair was long and limp, the color a dull reddish-brown. He definitely looked dead. A long time dead. Marisa shivered as she looked at the vampire again. Almost, Silvano had her believing the vampire was real. But, of course, it was just some extremely skinny man and some impressive stage make-up. She stared at the vampire's chest, silently counting the seconds. One minute passed. Two. The man never took a breath. Three minutes. Four. A cold chill ran up her spine. Maybe it really was a corpse. Silvano turned away as a pretty girl wearing a short red skirt, a white off-the-shoulder blouse, black net stockings and ballerina slippers called his name. Marisa watched Silvano leave the tent with the girl. Glancing around, she saw that everyone else had left, too. Heart pounding with trepidation, she realized she was alone with the vampire. She stared at the body. Maybe it wasn't alive at all. Maybe it was made of wax, like the figures at the Movieland Wax Museum. She laughed with relief. That was it, of course. Why hadn't she thought of that before? It was just an elaborate hoax. She glanced over her shoulder. There was no one in sight. Feeling foolish, she ran her fingertips over the links of the chains. They felt real, solid. A small fortune in silver. And then, unable to resist the temptation, she touched the vampire's hand. It wasn't made of wax. The skin was cold. Smooth and dry, it reminded her of ancient parchment. She gasped as the papery skin grew warm beneath her fingertips. And then, very slowly, the skeletal fingers on the vampire's left hand uncurled and spread out to lay flat against the smooth satin lining. With a shriek, Marisa jumped away from the coffin. She tripped as she stumbled backward, cried out as she tumbled down the steps. She scraped her leg on the rough wood, landed in the sawdust on her hands and knees. Shaken, she glanced over her shoulder, at worst expecting to see the vampire climbing out of the coffin, its fangs bared in a hideous grin, at best expecting to see an ordinary man sitting up, laughing uproariously because he had scared her out of ten years of her life. But all was quiet within the tent. Marisa scrambled to her feet, wincing as she did so. Looking down, she saw blood dripping from a shallow laceration just above her right ankle. Pulling a handkerchief from her purse, she mopped up the blood, then, with a grimace, she tossed the hanky in a trash can and hurried out of the tent. Blood. Warm and sweet and fresh. The scent of it filled the air, teasing his nostrils, tantalizing his senses, awakening a thirst that had lain dormant for a hundred years. His hand tingled as he remembering the touch of her hand, her fingers warm and soft, the throb of her pulse beckoning him. He fought through layers of blackness, a century of darkness, all his senses honed in on the irresistible scent of the woman's blood. He flexed his hands, his shoulders, licked his lips as the Hunger roared to life. With an effort, he opened his eyes. A cry of outrage rumbled deep in his throat when he saw the crosses. Three of them, all silver. With the return of awareness came pain - the pain of the silver chains that bound him, the raging Hunger that had not been fed for a hundred years. Marisa came awake with the sound of her own screams ringing in her ears. Breathing heavily, she switched on the bedside lamp and glanced around, relieved to find herself safe at home, in her own bed. Her hand went to her neck, her fingers anxiously probing the skin beneath her left ear. There didn't seem to be any bite marks. There was no blood. But it had seemed so real. The creature bending over the bed, his gray eyes glowing an unholy red in the darkness, his hands like claws as they clamped over her shoulders to hold her in place, his long reddish-brown hair brushing against her cheek as he leaned over her, his fangs poised at her throat. So real, she thought, so real. Leaving the light on, she drew the covers up to her chin, afraid to close her eyes, afraid to go back to sleep for fear the nightmare would find her again.